As automotive rivalries go, the Ford vs Chevy (or GMC) pick-up feud is as strong as they get. The question of which truck is better starts fist fights between drunk cousins at family reunions all over rural America. Such a heated conflict is not a good environment for parts sharing as any intermingling would suggest a weakness on one side that can be fixed with parts from the other. Your hybrid immediately becomes hated by both factions. 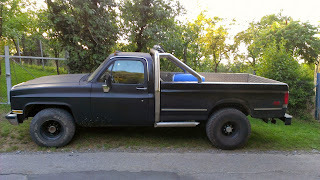 Perhaps this GMC-Ford love child was sent to Germany for its own good. Still, the question remains why it exists at all. I wasn't able to find anyone who would admit to being it's owner so it remains a mystery. Through collision or rampant corrosion a bed may need to be replaced but with all the extra work of attaching a Ford bed, was a GM box really hard to find? Grafting on the Ford bed wasn't a beer and sawzall operation. The gap between cab and bed has been taken up with a custom roll bar and much of the inner bed panels have been fab'ed from diamond plate. Despite the reasonable standard of bodywork, the result is a bit disconcerting. For instance, none of the character lines from either half even attempt to line up. 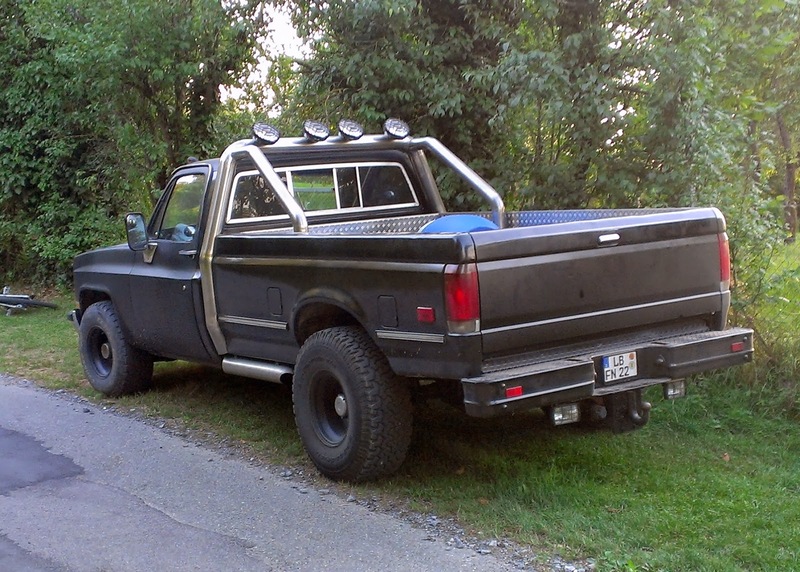 To most Germans this black beast is probably just another oversized example of American excess but to any red-blooded American an automotive red-headed step-child.